Ships from and sold by Trinh Ho. Comment: Shows shelf/handling wear. Clean pages no writing or highlighting. For starters i am a U boat nut,anything to do with U boats and im there, center stage,i probably have every single book written on the subject, i do love submarines in general, there is this allure about them thats hard to explain,during WW2 the Kriegsmarine made a million of these things (a slight exaggeration, lol) and 90% of them were sunk and the other 10 were destroyed after the war. 28 thousand young men went to their graves and the rest fought till the bitter end. anyhow for years Ive been wanting a book that had all the U boats listed ,what they did, who commanded them and how they met their end,THIS IS THAT BOOK. several of the books i own have a list but no information on patrols etc. i recently purchased the book on u boat commanders and that accompanied by this book could be a powerful combo to have as a cross reference although the book on commanders doesn't list for the most part what happened to the commanders after the war and there is as section with pictures of the commanders but not enough, just a select few. 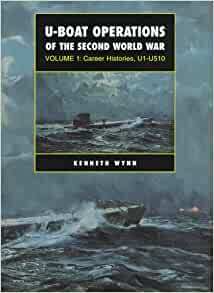 another person that commented on here said that this book "U-boat Operations of the Second World War: Volume 1: Career Histories" that i am discussing here had no pictures, well thats a minor thing since all u boats look alike,you have several different types that are of course very different but for the most part all the boats that were sunk were type VII's but thats something you can find in another book (pictures and diagrams) that specializes on u boats types etc. 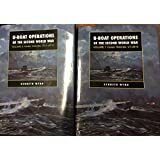 this is a book on what every single boat did during the war and it does it well,the author did some great research using several well established u boats research centers like the wonderful Horst bredow in Germany, if it wasn't for this man (bredow) we wouldn't know half of the history we know on u boats, he has made his lifetime crusade to keep a excellent record of all the personnel and all the boats that served during WW2,i sure hope he has picked a successor to carry on his work after he is gone. so if you are thinking about buying this book remember its actually two books,they are worth their weight in gold,excellent research and they are also very nice quality, a book you will be proud to have in your bookcase. something to remember is that all the information on these two books is online also on some very good u boat websites but im one of those people that love to read and actually hold a book in my hands and to me, books will never go out of style, at least not as long as im alive. again if you read this review i hope it convinces you to purchase at least one of these books, give it a try, you will be more than pleased with it!!! !